As I await Little’s arrival at the Cape Town International Airport, I can’t help but wonder if there wasn’t a better place to conduct this interview. But before I can wonder too much, he finds me in the back corner of a chosen restaurant—the quietest place I could find. Little is a man with the Bushveld in him. That is where he thrives, where he feels at home. A normal man at heart with a deep love for wild animals and conservation, his passion is evident almost immediately. With no formal training, Little started sculpting while still a game ranger but his love for it began at a much younger age. He gives great credit to his grandmother who, when he was a child, would give him a piece of plasticine and ask him to create something from it. In 2016, Little unveiled his largest project to date—‘Dawn Patrol’. ‘Dawn Patrol’ is a massive sculpted lion that stands at 8-metres long and almost 5-metres in height. He was commissioned to create this in order to celebrate the 50th anniversary of the Longleat Safari Park. However, more success was to follow off the back of that project. The Leonardo DiCaprio Foundation, which focuses “on numerous aspects of the planet”, invited Little to present ‘Dawn Patrol’ at a gala evening in Saint-Tropez, France. That night, the piece sold for US$1 million. His passion for conservation led him to donate the full amount to the foundation and while he says he cannot dictate where the money goes, he did request that “some of the proceeds come back to Africa and be used on our carnivores”. Ideally, Little would like the last edition of ‘Dawn Patrol’ to remain in South Africa. He explains that “the tough thing is to find a buyer” but he remains hopeful that someone will come along. He continues to say that there are many people who are interested but not many people have the space for such a big piece. This beautiful piece is indeed a celebration of the lion of Africa and surely it should be somewhere where it can welcome our vast amount of annual tourists. Perhaps even a place like an airport—what a sight to be greeted by upon landing or the last sight before you leave South Africa. This project took the best part of a year to complete. “I dropped everything else for around eight months—I wanted to create awareness for lions but I also wanted to show people that artistically, I could do something of this magnitude,” explains Little. As we’ve already seen, Little is exceptionally passionate about conservation of our African carnivores and most of his sculptures to date have been with that in mind. 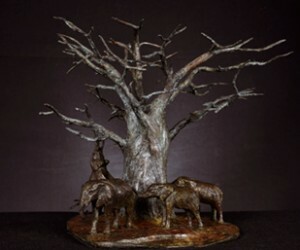 Other than ‘Dawn Patrol’, he has sculpted cheetahs, buffaloes, leopards, elephants and many, many others. However, his passion does not stop there. “We as humans seem to think that we are some sort of super animal but we’re obviously not. We seem to disregard that which has allowed us to survive this long on this planet and it is quite sad. To highlight these issues, Little wants to do some figurative work too. He explains that he will never leave his wildlife but he would like to “encompass the indelible bond that we as humans have with the Earth”. Little has already created two pieces in a similar line for this—‘Mother Earth’ and ‘Mama Africa’. “’Mama Africa’ is a voluptuous lady and it was one of those pieces that you just work on for a while, you don’t think about it too much, you let it evolve and you know she’s a very large, voluptuous mother of the earth, a lovely person, but she’s got roots for fingers and she’s got a tree growing out of her back and a waterfall—it encompasses nature and the interactions and the reliance we have on each other,” he explains. Much of the praise that Little has received for his sculptures is because of how realistic they look. The animal movements are captured magnificently and the proportions are always 100% correct. Little puts this down to his vast experience with these animals. With over 20 years and 3 000 game drives behind him, Little has studied these animals and their movements countless times. He explains that two-thirds of his work is done through memory but he also has a deep love for photography and he uses this for the proportions and anatomy of the animal. “My USP (unique selling point) is most definitely the fact that I have spent so many hours with these animals and I think many other sculptors would agree that the more time you spend with your project, the better you’d understand it and be able to capture the spirit of the animal,” Little says. Photography is also something he is trying to do more of. When he has exhibitions, he would like to have his pieces on the ground with images of the animals up against the wall to give it a bit more of a feel. “To me, a piece of art is never finished, the only time it is finished is when you have a deadline, and when that is the case, we work back from the deadline day—in that we have to include shipping, catalogues, pictures for the website etc.,” he explains. The problem most artists face in life is not knowing when their next pay cheque will be arriving. Little says he would love to do something like ‘Dawn Patrol’ for South Africa but other than costing a lot, it will also take too much time out of a year where he won’t be able to do anything else. ‘Dawn Patrol’ received a magnificent response when it was driven on the back of a truck to the Cape Town harbour for shipping to the UK. Once it arrived in London, the response was very similar and “it almost went viral”, according to Little. “Many artists face constant issues because getting loans from banks is almost impossible—you need to be able to show them a consistent income, not the odd big amount from when you get paid for a completed project,” he explains. Little continues by saying, “I tried to get a loan for this exhibition in London but despite never having a failed event and turnover has always been good, our good track record did not mean anything. “There are so many talented artists out there who will never have the opportunity to realise their true potential and to contribute to this country by virtue of the fact that they will never be able to get out there and host a mainstream exhibition or galleries or art fares, and will never be able to do the PR and the marketing that’s needed,” he laments. Little was fortunate that he had a paying job as a game ranger and was able to save some money. It has only been 7 years since he started sculpting full-time, despite doing his first sculpture in 1996. He lives by the fact that you must “stick it out, trust yourself and be clever in how you go about it”. Hoping to get things done is not something Little ever really does. It is always, “when it is done,” or “it will be done”, not much attention is paid to the possibility of something that might not work, or might not be successful. He is self-taught with the assistance of his grandmother who he says “pretty much deserves all the credit”. “I made a lot of mistakes when I started but you have to be a sponge, you must ask. The thirst for knowledge must exist within you, it’s all about your desire to achieve. “This is one of my great passions, to one day have a facility that affords young talented artists the opportunity I didn’t have growing up. They will be people who deserve the opportunity, people who will give back to the artistic community going forward. I will do this one day,” says Little. According to Little, YouTube is a great source of information on almost everything, including sculpting. While funding and training are difficult to come by, Little says he has been very lucky over the course of his career. When the banks have refused him a loan, others have stepped up to assist him, and he would like to be able to do the same for others. There is no definitive timeline for which Little wants to create these opportunities for aspiring sculptors, but he does want it to be within the next year or so. At this point, he is busy with the move to his new gallery, which is “another dream realised”. Having been based in Grahamstown, Little has now opened his own gallery in Stellenbosch, Cape Town. The move has, thus far, been good for Little and his staff. He claims that sales have been good, despite moving during a “very quiet time of the year” and, now, heading towards the tourist season, he expects continued growth. Little says that cost varies depending on production costs, which can be quite astronomical at times. Smaller pieces can be found for around R 4000 to R 5000 and then after that, “it’s a bit like a piece of string”. The very large pieces, like ‘Paw Patrol’ can fetch anything from 13, 14 or up to R15 million. He explains that all artists have a formula, a formula that varies from one artist to the next based on many things, including reputation. “I sometimes wish the buying community understood this formula better. There are so many other costs—agent fees can vary from 30-50%, foundry costs, PR and marketing etc. 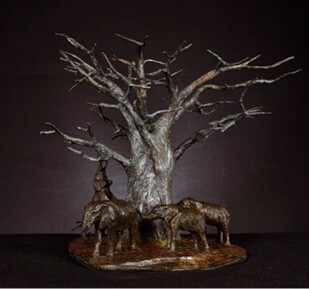 Just because the sales price is high, it does not mean that the sculptor is walking away with a lot of money. “If the sculptor gets a third of the cost, they have done very well and then overheads like the staff and business growth must still come out of that amount,” he says. The new gallery in Stellenbosch is only the start for Little. He is in the process of moving his entire operation down from Grahamstown and then, in time, he’d like to have more galleries. At this point, he has his eye on Franschhoek and then possibly the Cape Town city centre. Having galleries in Africa and around the globe is also part of the expansion plan, but this is not on the horizon just yet. Little does not just love the wildlife, he also has a great passion to conserve it. He wants to ensure that the future is preserved and that our magnificent wild animals remain for generations to see. The word ‘conservation’ is most likely mentioned by Little more than any other word during the conversation, but he believes there needs to be a voice for it. On an annual basis, he donates pieces of art to numerous fundraisers to raise money for conservation. When queried about the possibility of him creating a TV show, his response leaves one with no doubt. “It is a vision, it will happen. Obviously, it takes money and sponsorship but discussions are underway and reasonably far down the line—I am hopeful that by this time next year, we will be filming,” he enthuses. His second solo exhibition was, by all accounts, a great success. “We are happy with the number of pieces sold and it was good to catch up with buyers again—we have also managed to pick up some new contacts,” he says. The arts industry is not a flourishing market in South Africa but one would hope that Little along with other known artists keep encouraging those with the talent to pursue their dreams.